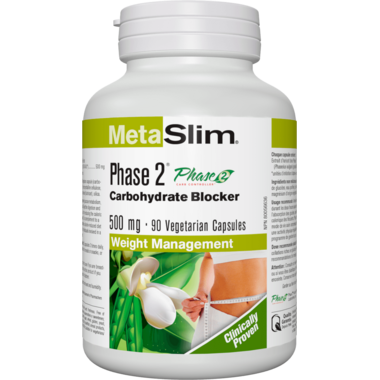 MetaSlim Phase 2 Carbohydrate Blocker is the first white kidney bean extract clinically proven to reduce the digestion and absorption of carbohydrates, thereby reducing the calorie impact from starchy foods. All MetaSlim products are formulated based on research to promote healthy weight management. Recommended dosage (adults): 2 capsules 3 times daily, to be taken before carbohydrate rich meals or snacks, or as directed by a physician. Each capsule contains: Phase 2 White Kidney Bean Extract (Phaseolus vulgaris) (seed) (1500 AAIU*) 500 mg *alpha-amylase inhibiting units Consult a physician prior to use if you are breastfeeding or have diabetes. Do not use this product if you are pregnant. Keep out of reach of children. I started using this during this past summer to see if I could improve the results of my challenge to eat better and exercise more. My weekly weight loss went from an average of 1 or 1.5 pounds a week to 2-3 pounds a week as long as I take it about 30 minutes before every meal with complex carbohydrates (pastas, oatmeal, etc). It's important to note this doesn't stop the digestion of sugars, just starchy carbs. It still seems to work well. I'm on my third bottle.